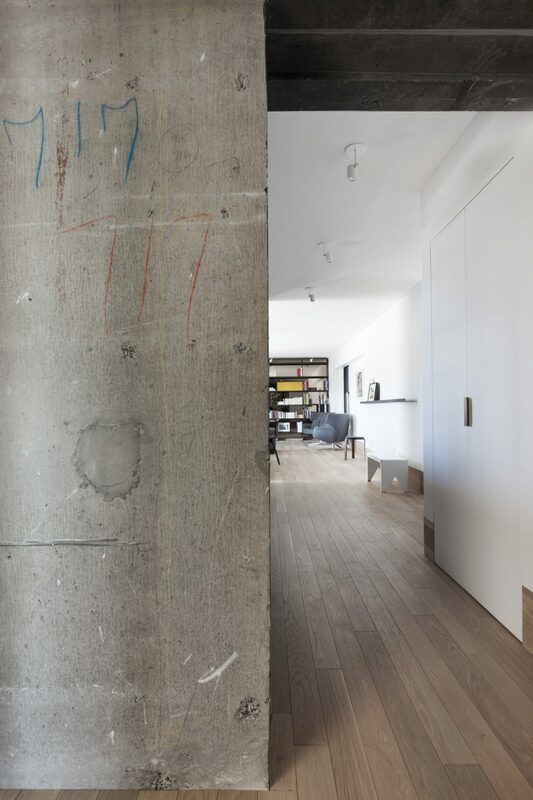 At first glance, it seems a little out of place: the numbers 717 are scrawled once in blue, once in red on an exposed concrete wall in the middle of a newly renovated condo in Habitat 67. 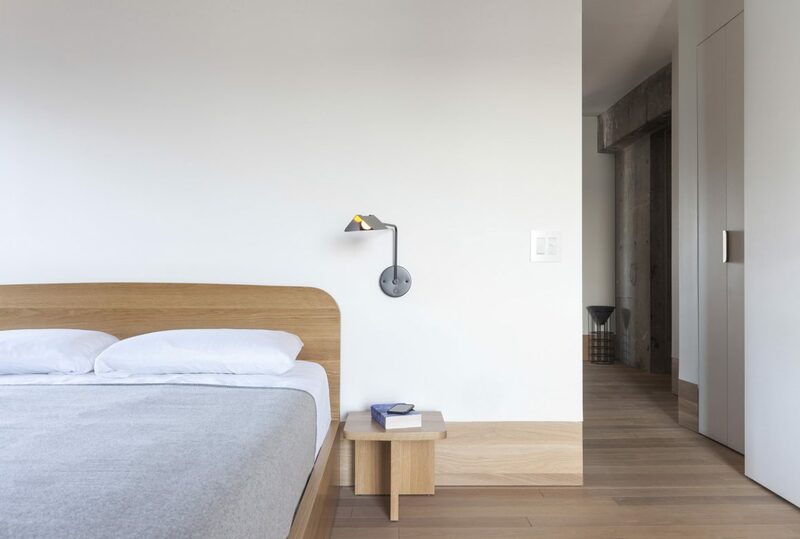 It’s at the junction of the two blocks that make up this unit in the iconic building and, when it was uncovered in the renovation, the owners and designers wanted to preserve that bit of its history. 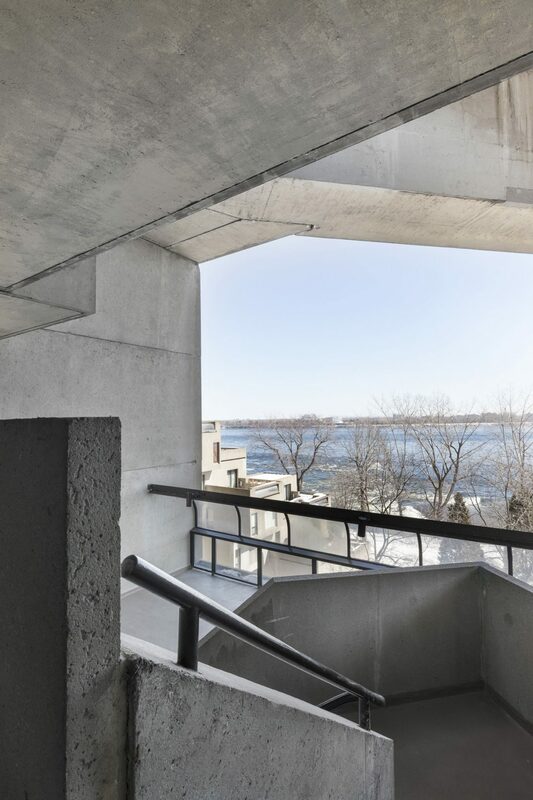 Like many visitors to Expo 67, the homeowner toured Habitat at the time and fell in love. “It took him 30, well, maybe 20 years to persuade his wife to move here,” Rainville says. But when the couple’s daughter moved out and it was time to downsize, he finally got his wish. The kitchen is compact, and structured around the window that has a view of the river. 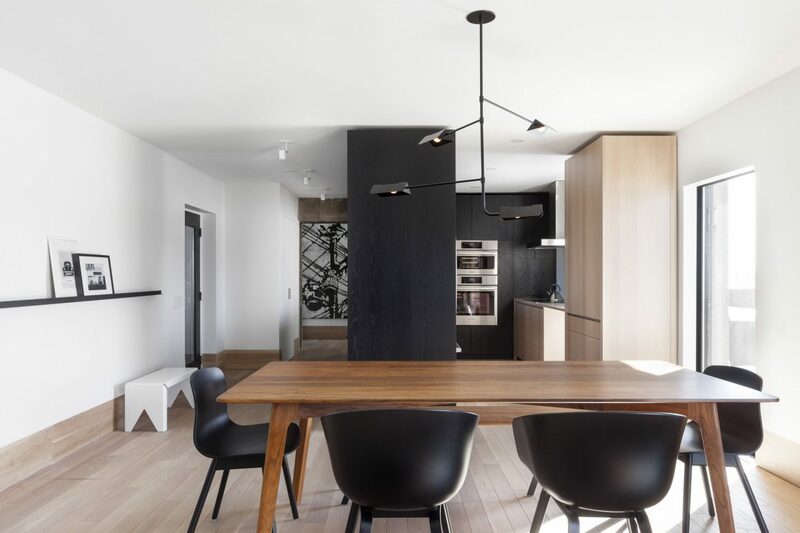 Rainville-Sangaré designed the light fixture in the dining room, as well as the others throughout the condo. The owners brought the walnut dining table, purchased from Kastella, from their previous home. Designed in a T-shape, one building block contains two bedrooms and two bathrooms; the second houses the kitchen, dining and living rooms, giving the owners about 1,300 square feet of indoor living space. There are also two balconies, one off the guest bedroom, the other between the kitchen and dining areas. “That’s usually where the party is!” Rainville says. The front and side kitchen cabinets have a black oak veneer; the back cabinets along the outside wall are in lighter oak. 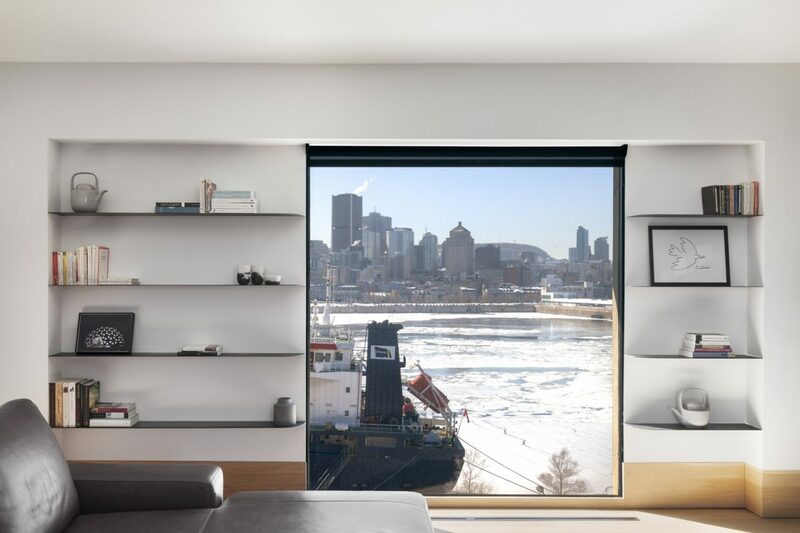 In the living room, there’s another window that overlooks the river, built into a recessed wall. 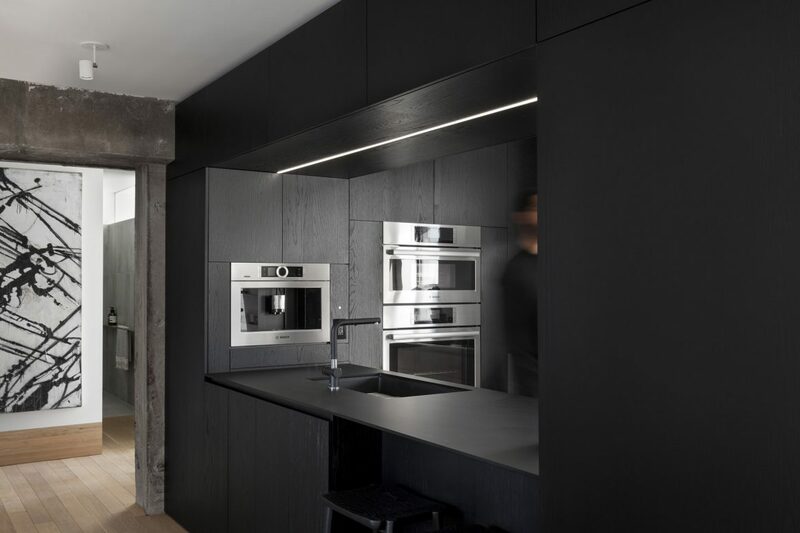 To highlight that architectural feature, Rainville-Sangaré flanked it with built-in steel shelves on each side. The owners brought very little furniture with them into this new space: their previous dining set, a living room sofa and a guest room desk. 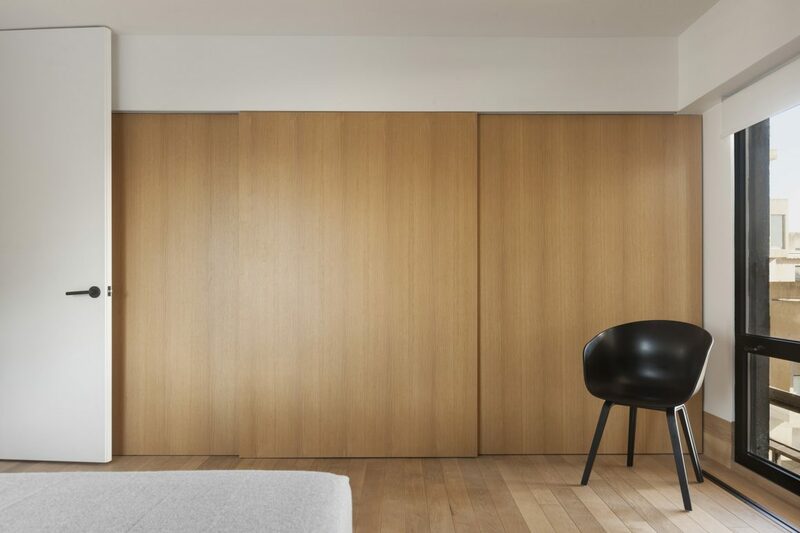 Open, raw-steel shelves in the living room stretch the width of the room and back on to a mirrored wall, at one end of the condo. 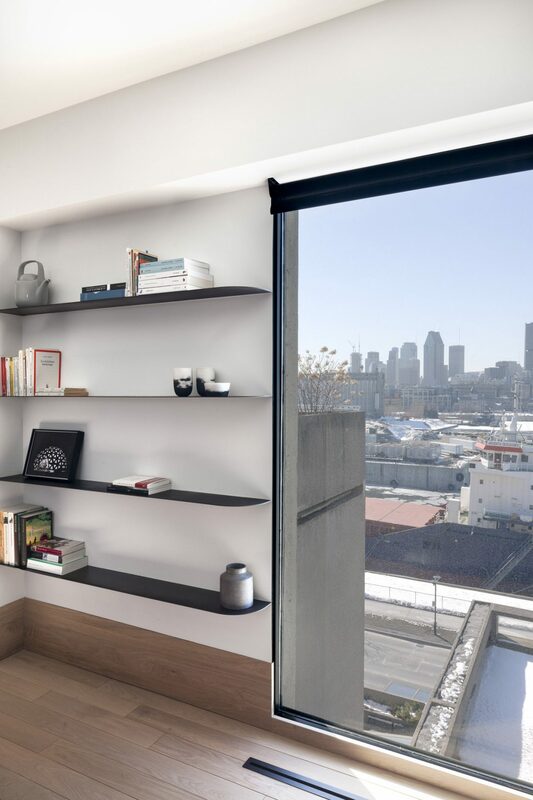 Similar steel shelving frames a recessed window along another wall. Behind the shelves is a wall of mirrors. It’s not original to the condo; Rainville guesses it was most likely added some time in the 1980s. The mirror is glued to the wall, so removing it would have been expensive. Keeping it was a happy compromise as it reflects light and creates a sense of more space. In the bathrooms, the grey concrete tiles are brightened by light reflected from dichroic film, a 3M product applied to the shower glass. Colours change depending on the angle of light, and it comes in two versions: either a warm or cool colour palette. It took months to source the film through an industrial vendor, the designer says. 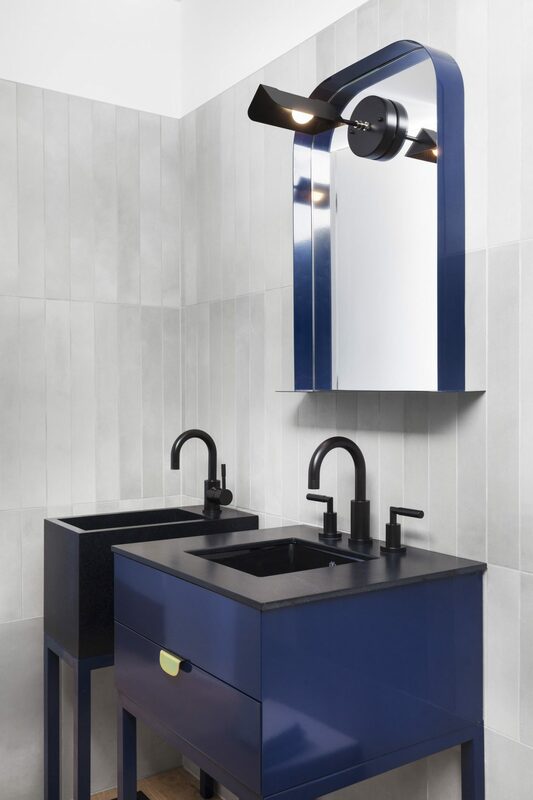 The choice of blue sinks in the guest bathroom is inspired by the St. Lawrence River. 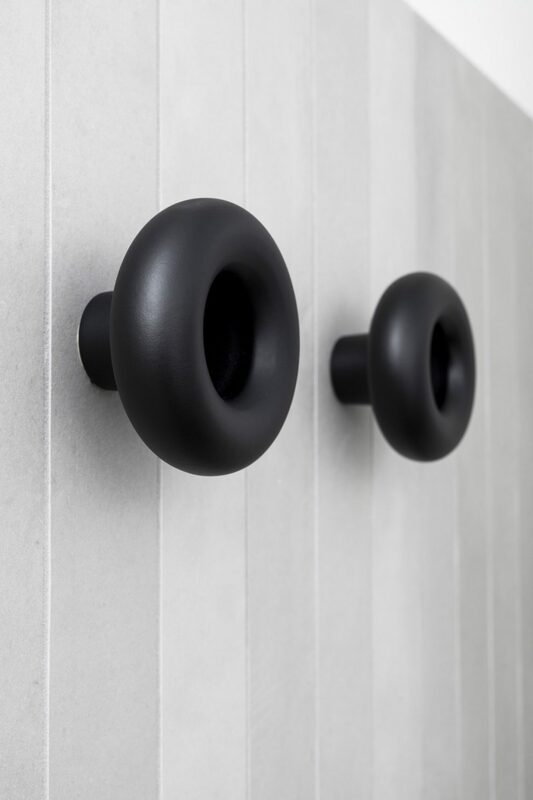 The round clothing hook in the bathroom is designed to be gentle on clothes and prevent denting fabric. Made of powder-coated aluminum, it’s left over from Rainville’s days studying design in London. The guest room has a Murphy bed. It’s also where the owner practices calligraphy. The bedrooms and bathrooms are around the corner from the kitchen in the unit’s second building block. It’s in the bathrooms that Rainville-Sangaré added colour. The owner’s hobby is calligraphy, so there’s a second blue sink in the guest bathroom in which to clean his tools and inks. 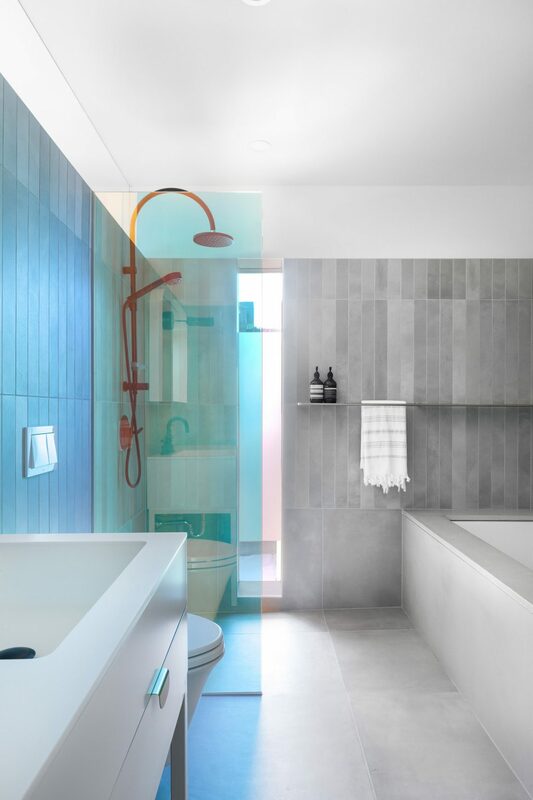 Both bathrooms have dichroic film coating the shower glass, a product that adds colour to the minimalist palette. “When the light source is behind the film, you see one colour; when you start moving, you start seeing new shades,” Rainville says. Depending on the angle of light, it goes from blue to pink and green, then to orange. A recent product, it’s used mainly in commercial installations, he says. 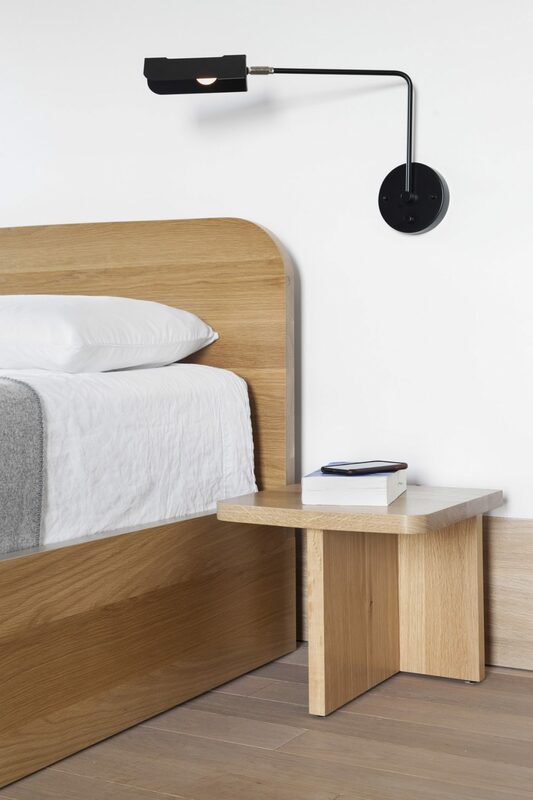 The master bedroom’s bed and side tables were custom designed and built in oak.